Today I had the honour and privilege to attend the ground breaking ceremony of Tesla Cancer Hospital in Kiambu County. 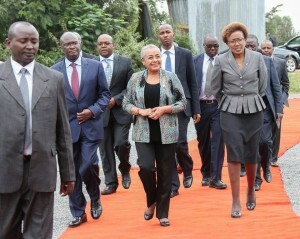 The event was graced by Her Excellency, The First Lady of the Republic of Kenya, Mrs. Margaret Kenyatta. I had the honour to share with her and the distinguished guests, my story, my journey as a patient. Below are the excerpts of my speech. Three (3) years ago I was diagnosed with stage 3 breast cancer. I will never forget that day when my doctor spoke those words to me, you have cancer. My 37th birthday was just weeks away and for the first time in my life I had serious doubts whether I would be celebrating that day. On December 12, 2012, as Kenya was marking its Independence Day celebrations, I was lying on an operating table in Delhi in India, getting ready to undergo surgery to remove the lumps in by breasts and lymph nodes and to have reconstructive breast surgery. As a single mother to 2 sons now ages 16 and 7 years, my prayer to God was to let me to live so that I can see them grow to adulthood. After two (2) years of intense treatment that included surgery, chemotherapy, radiation and drug therapies that took me from Kenya to India to South Africa, I can only reflect on all the good that came out of it. It was all about love and support from my family, friends, work mates, doctors, nurses and total strangers! I recognize that I am one of the few women in Kenya who get diagnosed with cancer at a late stage and get fully recovered. I get it, God has given me a second chance and I am eternally grateful and I am here today for a purpose. Let me say that despite the fact that I was on a good private insurance cover, and I am considered an upper-middle class Kenyan, I still exhausted my funds due to the high costs of treatment undertaken both locally and abroad. I am fortunate that I was able to receive financial support from friends, family, my employer, and to my surprise from complete strangers who sent in contributions when I made a public appeal for assistance. I stand here today, Your Excellence, Ladies and Gentlemen, to offer hope to my fellow Kenyans who have been diagnosed with cancer. I stand here today with hope that as a nation we can collaborate with Government, citizens and the private sector to improve our healthcare facilities. I applaud the Directors of Tesla Cancer Hospital for their courage and vision in undertaking this project, and especially for working to bring about Africa’s first PET scan machine to Kenya. As I stand here, I am reminded of a Kenyan woman, called Lillian that I met a few weeks ago. She reached out to the Second Chances Foundation for financial support so that she could travel to India to do a PET scan. Last week she informed me that the PET scan had found a mass in her liver which they are now testing further to determine how to proceed with treatment. Without the PET scan, Lilian would still be walking around not knowing what her real diagnosis is. With that said, without financial support, her treatment is in jeopardy. Just like my story, Lilian’s road to recovery is dependent on access to state of the art technology for proper diagnosis and affordable healthcare. Today, the launch of Tesla Cancer Hospital is a step closer to achieving that. In addition, I wish to applaud the Government on the launch of the National Cancer Institute. However, much need to be done by all of us! God Bless You and God Bless our nation, Kenya! Copyright © 2013. Second Chances. All Rights reserved.